Right thinking or thinking rightly? Ladies, when your husband tells you you're beautiful, he's not lying, even if you think he is. In his eyes, you are beautiful. Why is that so hard to believe? Because you see yourself differently from how he sees you. Marriage means learning to believe your husband and to see yourself as he does. That's the ideal. Sure, there are wicked husbands whose eyes make comparisons and haughty wives who consider themselves more highly than they ought. But the ideal comes from the Ideal Marriage, between Christ and His Bride, the Church. In His eyes, there is none more beautiful. He should know, after all, since He has made her peerless in beauty, removing the filth of her sinfulness and clothing her in the beauty of His righteousness. There's little practical difference between Oprah's positive thinking and the Word-Faith movement, except one claims to take the majority of its inspiration from Scripture. Both exhort you to get your thinking in order so that good things will follow. And both are wrong (and, neither is contained in Scripture). But what you think does matter. Your thinking doesn't determine reality, but reality determines your thinking. Here's the reality: those who are "in Christ" are free from sin and its condemnation. God knows this. He declares it, and so it is. This is justification, being made righteous before God. Sanctification is learning to believe what God knows to be true about you. From your perspective, though, you don't seem that sinless. You seem to embody what St. Paul describes in Romans 7, the life-long conflict between your old sinful self and your new sin-free self. But God who sees and knows all things, and who has declared you righteous for the sake of Jesus, doesn't see it like you see it. Who's right? God is. And yet, for the time being, so are you. And you still struggle against sin. The problem is that the reality God knows, where your sins are completely taken away and given to Jesus and His righteousness completely imparted to you, is hidden to your eyes. The Christian life, growing in grace and holiness, is not a matter of getting better. It's a matter of learning to believe about yourself what God knows and has declared to be true. In Jesus, you are sinless. You have no sins; they belong to Him. He is, after all, the Lamb of God who takes away the sins of the world. Luke, the Evangelist, records that the angel of the Lord appeared to Zacharias in the temple beside the altar of incense. He announced to him that his wife Elisabeth would bear a son, that he was to call his name John, that he would be a source of joy and gladness, and that many would rejoice at his birth. 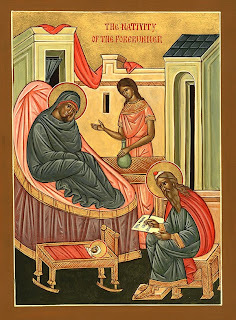 He also records the miraculous circumstances surrounding John’s birth, namely, that he was conceived of aged parents, of a mother who had been barren, and that he was filled with the Holy Spirit while still in the womb, that John’s birth, in fact, was particularly notable, much different than that of other human beings. It was not for John’s sake that all this was written, but for the sake of his office, in that he, as his father Zacharias stated in his Benedictus, would be teaching the way to obtain forgiveness of sins and entrance into heaven, not by one’s own works and merit, as the Pharisees had hitherto taught, but by grace alone, through the tender mercy of God, who gave his beloved Son for the sin of the whole world. Now, in spite of the fact that all the papists used to sing this Benedictus of Zacharias in their churches every day, and even now continue to do so in their morning matins, they have never understood it, nor do they understand it now. They have always kept this festival and observe it still, but only for the sake of St. John himself and his ascetic life. But we do not observe this day for St. John’s sake, but for God’s sake. We praise and glorify him because he brought the beloved John into the world and made him the preacher he was, one whose word of proclamation was that the world cannot be saves in any other way than by the forgiveness of sins. This was the nature of John’s preaching, as Zacharias foretold, and his sermons themselves testify. He rebuked and scolded the Pharisees and Jews for teaching that men must obtain salvation by personal piety and holiness. He called them a generation of vipers, and admonished them to exhibit the fruits indicative of genuine repentance. In other words, as if by clap of thunder, he hurled everything into one lump, calling all to repent, those whose repentance was not genuine and who supposed they had already repented, and the counterfeit “holy men” who fancied themselves as not in need of repentance. And his preaching focused solely on the Lamb, who would bear the sins of the world, that is, of all mankind born into the world. So we ought to thank our dear Lord God on this day of remembrance, for giving us the man John the Baptist, who was the first to preach the gospel for us, and to direct us to the Lamb of God. To be sure, the prophets preached Christ and pointed to him, but from afar, as to one who was to come in a future time. But John not only preached Christ by saying that no one can be saved except through the forgiveness of sins and the Lamb of God, who bears the sin of the world, but also pointed with his own finger to the Lamb declaring, Behold the Lamb of God. Formerly, before John came pointing with his finger, no Jew dreamed that this Lamb would bear the sin of the world, and that this Jesus, the son of Mary, would be the Lamb of God. They could not have come to the conclusion by themselves, that he would be the one, although he had already come into their midst, and was standing, walking, and living in their midst. But when John came, he declared, This is he, the one who shall do it. Zacharias says the very same thing in his Benedictus: John would be a prophet of the Most High, who would walk before the Lord to prepare his way, and teach the people the way of salvation, that is, the forgiveness of their sins; in other words, God in heaven would entrust to this preacher the task of pointing out the Lamb of God, through whom the people would obtain pardon for their sins and be saved. So let us observe this day of John the Baptist with joy, not because we adore John himself, a thing which he would not expect of us or even want, but rather because we acknowledge his office and are glad that he pointed to the Lamb of God, so that we might learn to follow him to whom he pointed. For John took no honor upon himself, but gave it to him who deserved it. “Whose shoe latchet,” he said, “I am not worthy to unloose” (John 1:27); and “I am not the Christ, but I am sent before him. He that hath the bride is the bridegroom: but the friend of the bridegroom, which standeth and heareth him, rejoiceth greatly because of the bridegroom’s voice” (John 3:29-29). The pope has given honor and worship to John, and ignored the Lamb of God. He has done the same with respect to the other saints. He has honored and worshiped the virgin mother of God, and ignored the infant Jesus in her lap. John would not tolerate that; instead, he turned all away from himself and pointed to the Lamb alone. “I indeed baptize you with water unto repentance: but he that cometh after me is mightier than I, whose shoes I am not worthy to bear: he shall baptize you with the Holy Ghost and with fire” (Matt. 3:11). In other words, I am only a tool of God’s; I preach and baptize in order to bring you to the Lamb of God. I am not the Lamb; but he is the Lamb, who bears the sin of the world. Therefore, do not look to me, but to the Lamb. We must understand this before we rightly perceive and know the Lamb. Then, if we know the love and grace which God has shown in him, giving us the Lamb, through whom we have the forgiveness of sins and eternal life, it will follow that we will also demonstrate this love to our neighbor, doing good to him, being gracious to him, and forgiving his sins if we suffer injury or hurt at his hands, just as God has forgiven our sins. If we do this, we shall be true Christians and pleasing to God. Let these few words about the beloved John, whose birth and preaching we rejoice in, suffice for the present and let us thank God for them. 5 Myths on Fathers & Families (For the full analysis and data, read the original article). 1. Myth: There's a surge in stay-at-home dads. Fact: Of the 22.5 million families with children under 15 years old, 24 percent have a stay-at-home mom, and less than 1 percent have a stay-at-home dad. 2. Myth: Women want everything 50-50. Fact: While women want their husbands to do their fair share of housework, they don't want them to do the same tasks. "Only 20 percent of mothers with children under 18 wanted to work full-time, compared with 72 percent of fathers with children under 18." 3. Myth: Marriage is just a piece of paper. Fact: "50 percent of children born to cohabiting parents saw their parents break up by age five; by comparison, only 15 percent of children born to married parents saw their parents divorce by age five. Dad is much more likely to stick around if he has a wedding ring on his finger." 4. Myth: Children can weather divorce just fine. Fact: Divorce is not good for children. Ask any child who's gone through a divorce. For instance, "girls whose parents divorce are about twice as likely to drop out of high school, to become pregnant as teenagers, and to suffer from psychological problems such as depression and thoughts of suicide." 5. Myth: Dads are dispensible. Fact: "Children typically do better in an intact, married families with their fathers than they do in families headed by single mothers." And "fathers bring distinctive talents to the parenting enterprise." What Wilcox doesn't address is the pastoral role of fathers. In the Large Catechism, Luther contends, "all other authority is derived and developed out of the authority of parents" (LC, 141). And the psalmist explains the role of fathers: "I will open my mouth in a parable; I will utter dark sayings from of old, things that we have heard and known, that our fathers have told us. We will not hide them from their children, but tell to the coming generation the glorious deeds of the LORD, and his might, and the wonders that he has done. He established a testimony in Jacob and appointed a law in Israel, which he commanded our fathers to teach to their children, that the next generation might know them, the children yet unborn, and arise and tell them to their children, so that they should set their hope in God and not forget the works of God, but keep his commandments; and that they should not be like their fathers, a stubborn and rebellious generation, a generation whose heart was not steadfast, whose spirit was not faithful to God" (Psalm 78:2-8). Fathers play the immeasurably important role of catechizing their children, of pastoring their families. They don't take the place of the Office of the Ministry but work in concert with it to see that their children hear the Gospel proclaimed and receive Baptism, Absolution, and the Lord's Supper. To your list of insightful Lutheran bloggers, you may add the Rev. Robert Baker. His blog, Bioethike, is as thought-provoking as it is well written. Today, he posted this, along with the following video. "While Dr. Bernard Nathanson’s confession about abortion (Dr. Nathanson was a founding member of what is know today as NARAL Pro-choice America) is not new, I believe the following video is powerful and effective. Dr. Nathanson converted to Catholicism in 1996 and I rejoice that he has found forgiveness in Absolution and the Sacrament of the Altar. May God bless Dr. Nathanson." Southern Baptists becoming Roman Catholic? Seriously? God meant that "fruitful and multiply" stuff literally? The Southern Baptists seem to think so. And, while Rome's prohibition against birth control is widely disregarded, there's no mistaking her position. I don't think the leaders at two prominent Southern Baptist seminaries necessarily speak on behalf of the entire convention, but it's nevertheless noteworthy. Next to Roman Catholics, the Southern Baptists are the second-largest Christian denomination in the U.S. And while neither might nor majority vote makes right, it ought to give other Christians who take the Bible seriously pause to reconsider where their love affair with contraception comes from (and, in the same vein, the thinking of children as a burden, rather than a blessing). And if the Southern Baptists "get it" that fewer babies means fewer baptisms and thus fewer conversions, when will the mission advocates in the Missouri Synod catch on? Why does Ablaze! count "critical events" where a person shares his faith to another person (who apparently has to have the chance to respond), but not Holy Baptism, wherein a person receives God's gift of faith? Can there be a more "critical event" in a person's life? No one will accuse the Southern Baptists of not being "missional." And they understand that a person's chief mission field is his family. That's a pretty astute understanding of vocation. Make babies; make them Christians. Missouri, sign here. Pseudogamy 104 - Egalitarianism in marriage is fiction. The difference between men and women is not a matter of mere reproductive hardware. Masculinity and femininity are unique gifts from God and not to be discarded in favor of some contrived sameness. Pseudogamy 105 - Happiness comes from the commitment to love, not the option to divorce. Your marriage vows are not said with some reservation that, if things don't go as well as planned, the vows can be broken. Breaking them is not an option. Pseudogamy 106 - The same kind of mindset produces economic instability as produces divorce. When one's word (whether an economic pledge or a marital vow) is noly good inasmuch as it benefits the one pledging, it's no good. My entering into marriage is not meant to bring benefit to me but to my spouse. Likewise, an economy only functions effectively if people understand their work to bring to others what they need and want. Pseudogamy 107 - What happened to community? We've become transient: "In a sense, easy divorce is a function of the more general and heart-dampening transience. We don't tend the land with care; we treat animals as if they were no more than meat-making machines; we ship our children off to day-asylums and then to school, and when they are not at school we leave them in the care of Hollywood; we don't know our neighbors; and we, surprise, surprise, uphold no-fault divorce. That last is the stake in the community's heart. It is transience in the most intimate relation we know on earth."